Field botanist Mr. Ulysses Ferreras visited Apulit Island Resort in Taytay last December 5-8, 2011. This is what happens when you combine AIR Environmental Officer Mavic Doctor and an expert botanist. How did I feel when I found out that a botanist would be visiting Apulit Island Resort? I was a little daunted, to be honest. Memories of my Biology 12 days rushed back with a vengeance. Oh, the burden of memorizing those families of plants! I wasn’t sure if I was ready to take on that challenge again. But Kring [Lagen Island Resort’s Environmental Officer] assured me that there was no need to worry. Uly, the visiting botanist, was very helpful. He can explain plants in ways that a beginner can understand – a group I fall in. Mr. Ulysses Ferreras, or Uly, is a young but very accomplished Filipino field botanist. He has discovered at least 15 species of plants here in the Philippines. He’s a really cool guy! He ferments his own wine, knows a lot about poisonous plants, and even knows how to concoct gayuma or “love potion”. Concocting “love potions” is something he learned from an Aeta community in Bataan and something he wouldn’t share with us – one of his trade secrets, he said. It was such an honor to be taught by someone considered to be an expert in his field. Hiro from the Guest Activities and Marine Sports Department served as our local guide so there was someone who could tell us the local names of the plants. For two and a half days, Uly, Kring, Hiro, and I walked around the island to survey the plants that we have inside the resort. For the hiking trail at the back of the resort, we were joined by Kuya Togs and Kuya Dean who also shared the local knowledge about the plants. I tried hard to capture all the things that Uly was saying. I paced myself with all the information that was coming in, while Kring and Uly jabbered on cheerfully with the scientific names. I focused on remembering at least the common or local names of the plants, thinking that I could always look up which family they belong to or what their scientific names were. Hiro was pretty good too – he knew a lot more than I did. He impressed all of us, getting us thinking what a good botanical tour guide he’d make. I had fun doing the fieldwork, enjoying the bits of trivia that Uly shared with us. I also liked the part when we’d just play around, climbing trees and swinging on the roots of the balete (the local name for strangler figs). One of the highlights of this fieldwork was when we found mistletoe around the resort. 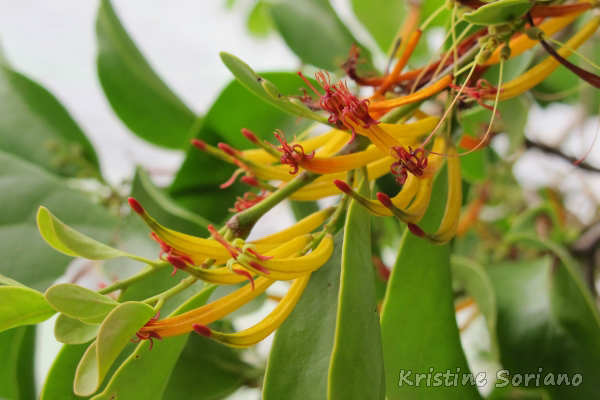 I never knew that there was mistletoe in the Philippines! What makes it even more exciting is Christmas is just around the corner. Maybe we’ll see people meeting under the mistletoe to kiss.